On June 23 AB 2145 passed out of the California Senate’s Energy Committee somewhat weakened but still tremendously lethal. The bill, introduced by powerful corporate forces, is meant to kill Community Choice energy programs in California. Despite a powerful statewide effort to bury AB 2145 in the Senate Committee (see for example, the June 19 Oakland protest), the bill emerged intact, but in an amended form. While its most problematic provision (opt-in) was removed, AB 2145 still contains two caustic provisions, and a newly proposed, anti-competitive geographical limitation. It is now headed to the Senate Appropriations Committee for action on August 4. Californians for Energy Choice, the broad statewide coalition of over 150 local government, environmental, social equity, business, and labor groups, remains strongly opposed to the bill. The coalition, in which the Local Clean Energy Alliance is playing an important leadership role, is mobilizing to stop the bill in the Appropriations Committee. AB 2145, even as amended, would undermine local energy choice, thwart the development of energy efficiency and new local renewable power resources, undercut local communities’ ability to create local clean energy jobs, limit reductions in greenhouse gas emissions, and infringe on local government decision-making power. 5 Year Rate-Setting Community Choice Poison Pill: AB 2145’s requirement that Community Choice programs set rates for customers five years in advance (while the monopoly utilities have no such requirement) is an unacceptable double standard. 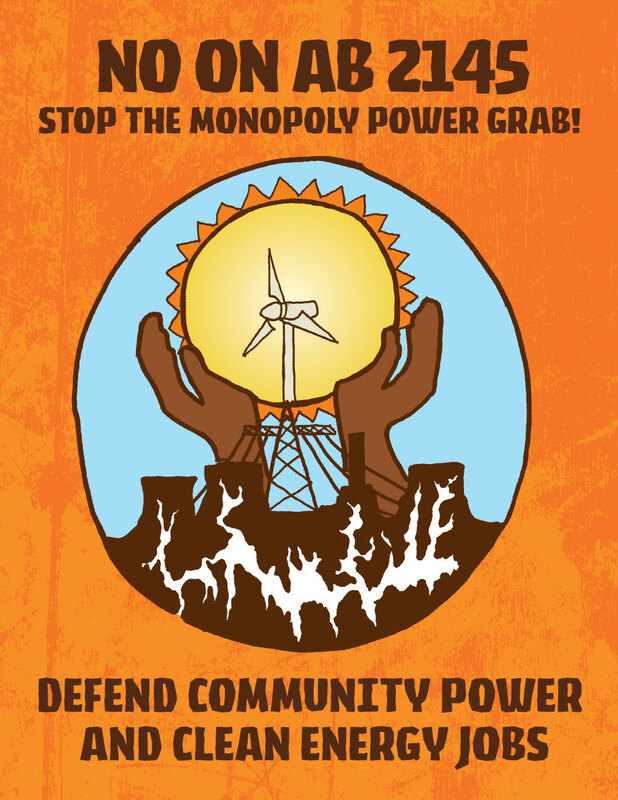 It is yet another attempt to place regulations on Community Choice that the utilities themselves don’t have to follow. It would be impossible for any energy provider to set rates five years in advance. This provision would expose Community Choice to endless lawsuits over even the smallest unexpected rate changes, and could potentially shut down every Community Choice program in the state. Unprecedented Costly Complaint Process Bureaucracy: AB 2145 takes customer relations oversight away from local accountable elected officials, and places it in the vast state-level bureaucracy of the CPUC. No other local public water or power systems are placed under such a heavy handed, distant, state agency governing process. This section would tie local Community Choice customer relations in knots, would create a financial burden both locally and at the CPUC, and would delay timely resolution of customer communications and concerns. Anti-competitive Geographic Barriers: AB 2145 now contains a three-county restriction that would prevent cities and counties from grouping together to serve larger numbers of customers in order to buy and generate energy at lower bulk rates and compete on electricity prices with the monopoly utilities. Many small, rural, and lower income communities would find it impossible to launch Community Choice programs, because they would be forced to do so with a prohibitively small customer base. To limit the size and buying power of Community Choice programs undermines their competitiveness, especially when the utilities have no such restrictions. The No on AB 2145 campaign is urging organizations to write letters of opposition to the Senate Appropriations Committee. It will also be launching an effort to petition and make telephone calls to Committee members in the runup to the August 4 committee hearing. For more info, email Californians for Energy Choice or call 530-309-6059.